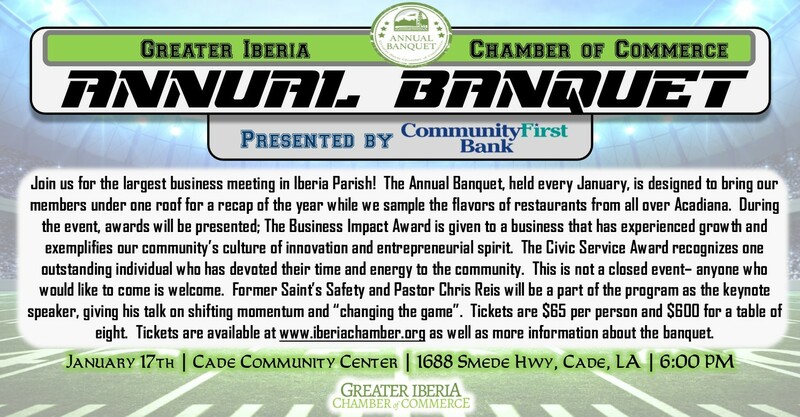 The Business Impact Awards are given to recognize and promote our community’s culture of innovation and its entrepreneurial spirit as well as celebrate the business success of Iberia Parish. Previous winners include Berard Transportation, Iberia Urgent Care, Concrete Revolution and Bayou Companies. Nominees need to have some physical aspect in Iberia Parish and is encouraged (but not mandatory) to be a current member of the Chamber. The awards recognize one or more of the following aspects: outstanding business development in growth and/or expansion, product and/or service diversification and/or innovation. The Civic Service Award is given to recognize an outstanding citizen who has demonstrated exemplary service by volunteering energy and time into our community. There are many citizens who are constantly volunteering in Iberia Parish toward civic projects, with various charities, in schools, and in churches that go unnoticed. This award is our way to thank and honor their commitment and hopefully inspire others to make volunteering a part of their lives.